Abstract. We present results from our investigation into the physical mechanisms through which the mid-Pliocene, with a pCO2 of only ∼ 400ppmv, could have supported the same magnitude of global warmth as has been projected for the climate at the end of the 21st century when pCO2 is expected to be 3 times higher. These mechanisms allow us to understand the warming in terms of changes to the radiative properties of the surface, the clouds, greenhouse gases, and changes to the meridional heat transport. We find that two-thirds of the warming pervasive during the mid-Pliocene, compared to the preindustrial, could be attributed to the reduction in the planetary emissivity owing to the higher concentrations of the greenhouse gases CO2 and water vapor, and the remaining one-third to the reduction in planetary albedo. We also find that changes to the orography and the pCO2 are the leading causes of the warming with each contributing in roughly equal parts to a total of 87 % of the warming and changes to the polar ice sheets responsible for the remaining warming. Furthermore, we provide a mid-Pliocene perspective on ongoing efforts to understand the climate system's sensitivity at various timescales and using multiple lines of evidence. 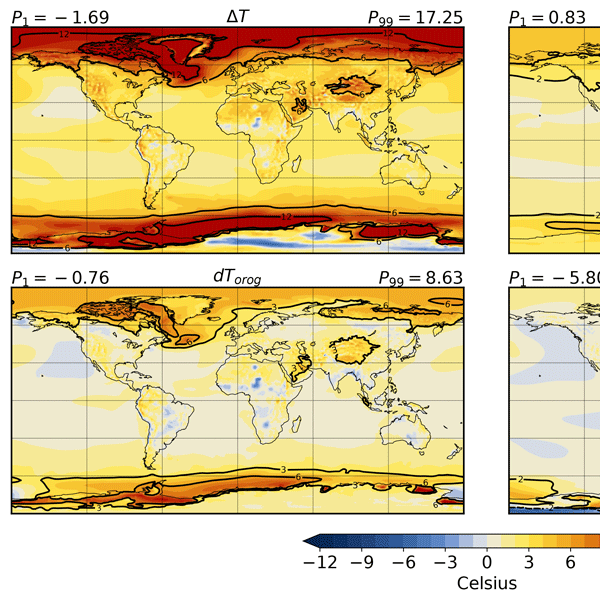 The similarities in the boundary conditions between the mid-Pliocene and the present day, together with the globally elevated temperatures, make the mid-Pliocene an ideal paleo time period from which to derive inferences of climate sensitivity and assess the impacts of various timescale-dependent feedback processes. We assess a hierarchy of climate sensitivities of increasing complexity in order to explore the response of the climate over a very large range of timescales. The picture that emerges is as follows: on the short timescale, owing to the influence of fast feedback processes, the climate sensitivity is 3.25 °C per doubling of CO2; sensitivity increases to 4.16 °C per doubling of CO2 on an intermediate timescale as the ice–albedo feedback becomes active, and then sensitivity further increases to 7.0 °C per doubling of CO2 on long timescales due to the feedback from the glacial isostatic adjustment of the Earth's surface in response to the melting of the polar ice sheets. Finally, once the slow feedbacks have stabilized, the sensitivity of the system drops to 3.35 °C per doubling of CO2. 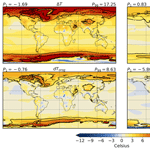 Our inference of the intermediate-timescale climate sensitivity suggests that the projected warming by 2300CE, inferred using Earth system models of intermediate complexity on the basis of an extension to the RCP4.5 emission scenario in which atmospheric pCO2 stabilizes at roughly twice the PI level in year 2150CE, could be underestimated by ∼ 1 °C due to the absence of ice-sheet-based feedbacks in those models. How to cite: Chandan, D. and Peltier, W. R.: On the mechanisms of warming the mid-Pliocene and the inference of a hierarchy of climate sensitivities with relevance to the understanding of climate futures, Clim. Past, 14, 825-856, https://doi.org/10.5194/cp-14-825-2018, 2018.